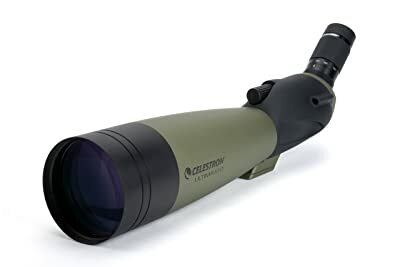 6 Best Spotting Scope Reviews 2019 - Which is for Hunting, Birding? Spotting scopes are designed for a few specific purposes, with options ranging from inexpensive to extremely expensive. Perhaps the most important factor to consider when choosing the best spotting scope is what you will use it for. What are your plans and goals for using this tool? As you make this decision you should pay close attention to a few key features and the benefits these features deliver. You’ll have the opportunity to look at these more closely later on in this detailed review article, but for now it will suffice to list a few of those important elements. One of the primary technical features you should concentrate on will be magnification and range of the lenses. You’ll see numbers like 6X, 100X, 80mm, 65mm and so on. The first two numbers mentioned here – 6X and 100X – indicate the range in magnification. Each product will have this feature prominently listed. The second number is the objective lens size, usually starting at 40 mm and ranging up to 100mm. Scopes will vary in overall length as well, usually from about 7 inches to as long as 20+ inches. You’ll also find the cost of a suitable scope can range from about $200 to as much as a $1,000 or more. For the purposes of this review, six scopes have been selected that qualify as medium-priced or perhaps a bit lower, though all will be more than adequate for spotting purposes. It’s very important to compare prices from various suppliers as well. This may help you keep a bit of money in your pocket, while getting you an outstanding scope. 1 What is a Spotting Scope? The name says it all, really. When you purchase a quality spotting scope you’re getting a small telescope that is best used in daylight (or adequate light). When you look through a spotting scope you get a magnified image, with size determined by the lenses installed by the manufacturer. These scopes are smaller than telescopes used for astronomy, for example, primarily because a spotting scope is meant to be carried into the field, sometimes in less-than-ideal conditions. They will have lower magnification than telescopes used to view stars, simply because the range at which they’re used is more limited. But it’s possible to get an excellent view of your object hundreds of yards in the distance. Even with their smaller size, these scopes can be used on a tripod, with the correct mounting hardware, of course. This gives you more comfort during long-term spotting. Almost every scope you purchase today will have excellent waterproofing and fog-proofing, so you don’t have to be concerned about taking your equipment out in inclement weather. You also benefit from the higher magnification of a spotting scope, compared to binoculars. 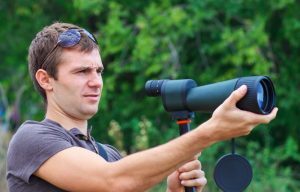 People use these scopes for hunting, for viewing landscapes, for bird-watching, as well as for surveillance. You might even want to talk to your supplier about using a spotting scope with camera attachment to get long-range photos! The essential features you should look for in a quality spotting scope are relatively few: magnification, body material, straight or angle (or both), weight, and of course, quality of optics. 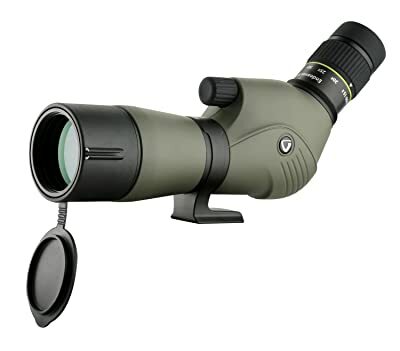 Magnification in a spotting scope can be thought of as a next level, beyond your normal binocular range You’ll need the higher magnification for wildlife and hunting. Look for three important numbers. For example: 20X – 60X and 60mm. Keep in mind that increases in magnification will usually have negative effect on clarity, so it’s important to find a scope that balances magnification and clarity. If you purchase what many consider the “premium” scope, you’ll be able to have great clarity even at a 60X magnification. Generally, you’ll be well-served with magnifications in the 30X or 40X range, so you don’t have to empty your bank account to get good performance. The third number refers to the objective lens. Basically, when this lens is larger you will see more detail. But you should always find a balance with this number as well – quality of image and size. Just because you see a large number for the objective lens doesn’t mean you’ll have the best image quality. Always look for a scope with multi-coated lenses. Here are a few additional details you should consider when shopping for the right spotting scope. Prism – This detail makes sure you see the image with the correct side up and also correct in reference to right and left. While this seems obvious, think about how the older cameras used to display the image in the viewing-box area. Close Focus – This can be a great feature. If you find a scope you truly like, and it has a close-focus rating under 20 feet, you’re on the right path. Some of the top-shelf scopes let you view as close as six feet. Lens Coating – Manufacturers now coat lenses to improve the delivery of light to your eye. You’ll see references to multi-coated, fully coated, and so on. The better scopes will have fully, multi-coated lenses. Eye Relief – Pay attention to this detail as you shop. This refers to how close you can place your eye to the eyepiece and still be able to see the full field of view. If you wear corrective glasses or you can’t get close to the eyepiece for any reason, look for eye relief of about 16mm or a bit farther. As you shop, pay special attention to comments about waterproofing and make sure you’re comfortable with the size and weight of the scope. Weight of spotting scopes varies a lot, with the heavier scopes giving outstanding performance when used on a tripod. There are, however, scopes of great quality that you can carry with little effort. You’ve read about the three important numbers on a spotting scope, so you have some of the necessary information for buying your scope. You’ve also read about such details as eye relief, lens coating, prism, and close focus. Here are a few questions you can ask, of yourself as well as of someone you’re discussing spotting scopes with: How much do I want to pay? Will I be spotting for short-range shooting or long-range shooting? How much does size and weight matter, in relation to how I’ll be using the scope? Will I be in bad-weather conditions? Your answers to these basic questions will be a great help in your shopping and in your final purchase decision. If you have a budget limit, such as $300, you’ll be able to find excellent scopes with all of the necessary features. But you should make sure you’re buying the scope that will work for your spotting activity, so money shouldn’t be the only factor you use in making your choice. If you’ll be in one location for any length of time, waiting for targets to capture in your scope, you might consider a slightly heavier scope that will be mounted on a tripod. If your field activity involves moving about quite often, you might be better served with a lighter scope you can carry. Of course, it’s always best to get a rugged, waterproof scope, just in case you’re caught in difficult conditions. Don’t be caught up in the belief that bigger is better when it comes to magnification. Remember the advice mentioned earlier about finding a balance between magnification and clarity. 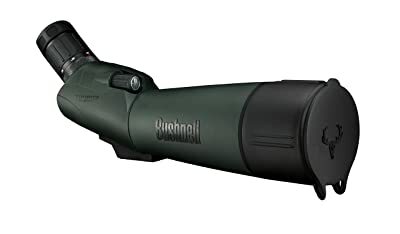 The first scope carries a recognized name in the world of outdoor optics – Bushnell. For this review we’ll look at the Trophy XLT 20X – 60X, 65mm spotting scope. It has found favor with many users because it’s compact, durable, and waterproof. Key features from which you’ll benefit include use of highest quality materials in the manufacturing process, with extensive testing by the manufacturer to ensure reliability. The optics are excellent, providing great, high-definition clarity, which is what you’d expect from this company. The design is very pleasing to the eye, a nice touch with a spotting scope built this tough. The scope is just a bit more than 13 inches long and weighs about 42 ounces. The rubber housing makes this scope waterproof and rugged, and the multi-coated optics deliver outstanding images. When you buy the Trophy XLT you get a compact tripod and a hard-side case. Your next option among quality scopes is the Viper HD from Vortex Optics. While you may have to shell out a bit more for this scope than with a few others, you do get an unconditional lifetime warranty from the company. The multi-layer coatings (Prism) give you some of the brightest, most-accurate images you’ll find in a spotting scope. You also benefit from the low-profile mounting which gives you additional stability and great comfort when you’re looking for a longer period of time. This also makes the use of a smaller tripod possible. Lenses are finished with a scratch-resistant coating for better protection. 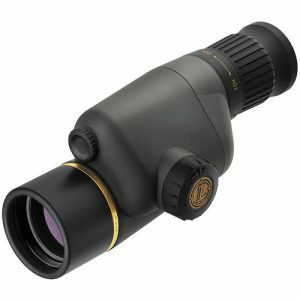 This medium-priced scope is highly regarded for overall performance, plus you get a lifetime warranty (limited). 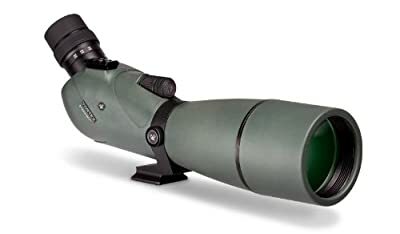 Optics are multi-coated, as is the case with most quality scopes, and you get the added performance of a zoom eyepiece. The sight tube helps you find targets quickly as well. Easy to transport with the soft carrying case. This quality scope is marketed as “angled eyepiece” which can be very important to the serious scope user. It’s also a medium-priced product (15X – 45X, 60mm) featuring prism, multi-coated lenses and excellent light levels even in low-light settings. The Endeavor XF is waterproof and fogproof and has a rubber-armored body of magnesium, making it tough but light at 45 ounces. Vanguard also delivers a quick-adjustment wheel for focus and gives this scope a lifetime warranty. The Redfield Rampage has an angled eyepiece for long-term comfort and delivers a lot of great features for a price in the medium range. It has an armor-tough rubber housing to give it outstanding durability. The Redfield scope fits well in this class with the 20X – 60X magnification and 80mm objective lens. As with the Vortex scope, you will probably have to give a bit extra, but there are individuals who insist on Leupold quality. It’s extremely light but delivers all the performance you should expect from a quality spotting scope. It offers multi-coated lenses, of course, and is 100% waterproof/fogproof. 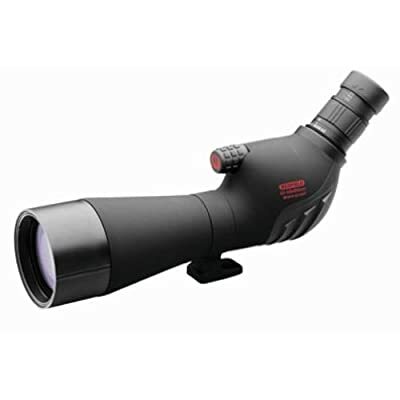 This scope is 10X – 20X, 40mm and gives you unmatched optical quality. Leupold also offers a full, lifetime guarantee. It has a side-mounted focus knob and is only 7.5 inches long. You could become very confused by trying to look at and inspect the dozens of spotting scopes available. But, you should be able to choose from among the short list presented here, or at least select from one of the six manufacturers presented. Prices range from $200 to $1,000, so this makes it even more difficult to decide. But, you can get a very good scope without breaking the bank, so to speak. If you have to have the lightest scope, choose the Leupold. 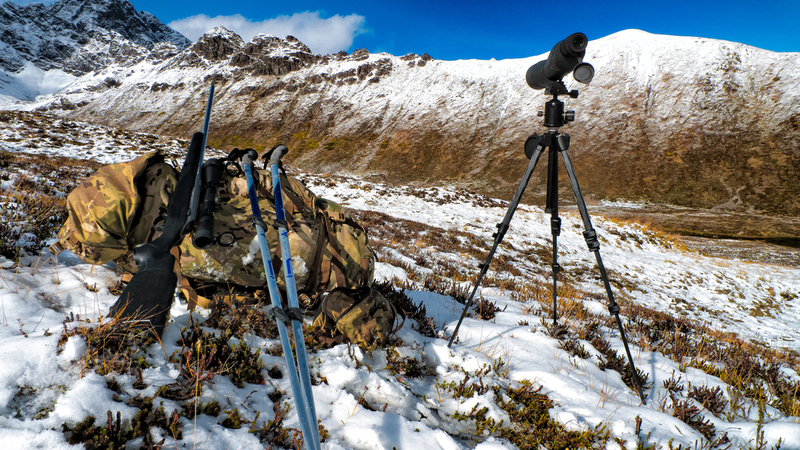 For a solid, rugged scope to be used on a tripod, Bushnell or Vanguard could be a great choice. But, in truth, you won’t go wrong with Redfield, Vortex, or Celestron either. Make sure you’re comfortable with the price you pay for the features and benefits you receive. The buying process for a spotting scope is no different from making any other significant purchase. Some of the names mentioned here must only be available in the US but not in Europe – I’ve heard of Vortex and Bushnell, but they never really caught on over here. Unfortunately, the only way to get a really great scope is to spend your bucks on Swarovski, Kowa, Zeiss or Leica (sadly, Nikon appear to have given up). great content and you explain product ins and outs clearly. can I buy these from outside USA?